At the end of the first week of my second year of university, I called my mom and told her I didn’t think I would be able to make it to the end of my school year. I was heading out the door to cover my first journalism event and had spent the afternoon frantically calling doctors, pain clinics, support groups – anyone who could help me find strength to carry on. I tearfully got off the phone with someone from a Fibromyalgia advocacy group, closed my eyes, took several deep breaths and checked for any mascara smudges as I quickly headed out the door. I was an emotional wreck, barely able to keep myself together as I walked to the bus stop, on my way to cover an art show. Somehow I was able to make it through the night and grabbed a taxi home as soon as I could make an excuse to leave. I avoided my five other roommates as I navigated my way through the tiny house to my bedroom where I promptly collapsed on the bed, exhausted in every way imaginable. I think it was this night, or another similar, that I discovered a bible verse that became my safe haven and comfort through the trying year ahead. To say the year was my worst thus far would be an understatement. Not only was my good health merely a facade crumbling around me, but my school load was almost unbearable, and my roommates, for the most part, turned against me, gossiping about me to all hours of the morning, eventually writing cruel remarks in a public Facebook post. I was on the verge of collapse by the end of my first week. To this day, I am still am at a loss at how I made it through the year. But that was the year I truly learned to lean on God for my strength, endurance, relationships, health and joy. Through it all, a spirit of joy was at the heart of my prayers – every minute of every day I desperately clung to God’s mercy and grace. It was one verse that guided me through the surrounding darkness and allowed me to see the light of hope in the distance. It was that night, flipping through my Bible, opening to random pages, frantically searching for comfort and meaning, my eyes were drawn to the first chapter of James. When things looked like they were at their bleakest this became my verse. It’s hard to think of a verse that gives me more comfort and in giving me such comfort its come to define my life. It has taught me that joy can be found at all times and in any situation. Joy is the hope that there will be an end to trials. Joy is the knowledge that there is another world I am made for. It is a smile in the midst of tears. The victorious sun breaking through the blackest horizon. A father’s outstretched hand to a fallen child. It means a slate wiped clean. Strength enough to finish the day. The kind words of a friend. Knowing you are loved. Being fully known and fully accepted. Encouragement at the end of the race. Endurance freely given. The right gift at the right time. Comfort and warmth. Knowing one is safe. Perfect rest. Peace at the end of a long day. The warmth of a camp fire. The smile of your beloved. Trust rewarded. The sound of waves crashing on the sand. A kitten’s soft purr. A kiss on the forehead. A warm touch. The comfort that God has a plan and there is purpose. Grace freely given. Mercy given without merit. God’s sacrificial love. *It is important to clarify before we go any further that joy is not the same thing as happiness (although this is a notion secular society has successfully used to confuse many Christians). Because joy can be found in the good and the bad, the terms joy and happiness are clearly not interchangeable. So many things bring me joy, so often my mouth overflows with joy-speak, so consumed by joy that surpasses all understanding. The word James uses for joy in the original greek manuscripts is chara, meaning gladness or reason for gladness, often used in the context of the primary response to the message of salvation. It is the same word Luke uses in Luke 2:10 when the angels tell the field of shepherds of the good news – the birth of a child whose life and death will save the world. It is again used in Luke 8:13 by Jesus in his explanation of the parable of the sower. He says those who receive the word of life, receive it with joy. Matthew uses this same word as he describes the feeling of the first disciples running to spread word of the empty tomb and their resurrected Lord. Chara is also used in Acts 13:52 after Paul and Barnabas are driven out of a town by persecution, they were filled with joy and with the fruit of the Spirit as they continued on their way. In this case in particular, joy directly followed and was in fact caused by suffering and oppression. At the heart, joy is both a feeling and an action in the Christian life. 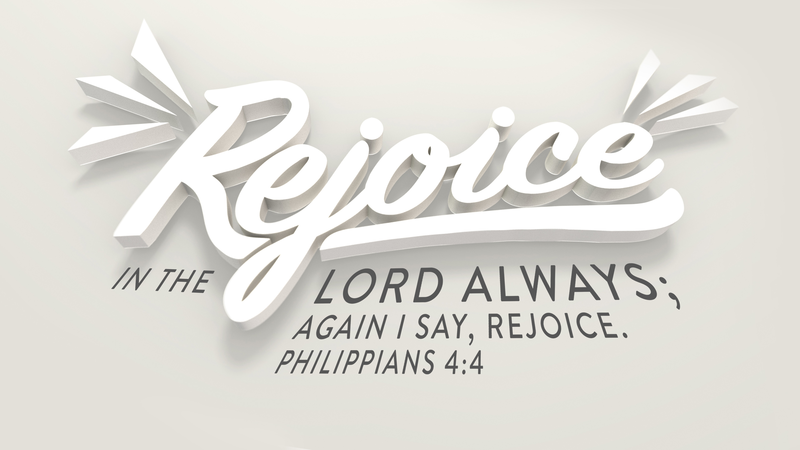 Paul even commanded continuous rejoicing in one of Philippians most well-known verses, 4:4. It is this unique, continued state of joy that allows Paul to later say he has learned to be content in all situations. This is only possible in all situations if the fruit of the Holy Spirit is present in the lives of Christians. The joy James is referring to, is the joy felt by all believers when they first cross from death to life. The joy the slave feels when he is freed. The joy felt by a dying man pronounced to be well. The joy a servant of Christ has in the midst of persecution. And James says to count it all joy: The joy of a soldier reuniting with his family. The joy of parents meeting their firstborn child. The joy of a kid in a candy shop or on Christmas morning. The joy of devouring freshly baked bread. The joy of starting the first Harry Potter book. The joy of finishing the last Harry Potter book. The joy of being late for work. The joy of catching a cold. The joy of failing a big test. The joy of a loved one’s last days. The joy of being diagnosed with terminal cancer. The joy of being racially discriminated against. The joy of being a victim of a crime. The joy of chronic illness. The joy of a painful death. James says to count it all joy. So was James was a sadomasochist who enjoyed a bit of pain or was he on to a new way of living? As James did die as a martyr, some may wish to stay with the first option, but judging by Christianity’s exponential growth and expansion, his new way of living had some major curb appeal. That means James placed the words “pure joy” and “trials” in the same sentence, an impossible feat by all worldly standards, only possible if God is in the driver’s seat. The book of James is often called the “Proverbs of the New Testament” as it is a book of wisdom and reminds its readers how to live. Its author sought to provoke in its readers new thoughtfulness and direction in their lives. To promote a change in both the thinking and acting of the growing Christian body. Christianity was not known as Christianity until centuries after the book of James was written. During this time the body of Christ-followers called themselves “The Way.” In just two words, early Christians concisely summarized numerous distinctive characteristics of the world’s fastest growing religion. First, The Way, claimed exclusive status as it is the way, not a way. Secondly, The Way, told curious A.D.-ers that Christ followers had a specific and distinct approach to life than the rest of culture. Thirdly, the name also suggested that followers know the right way to live, and that there is a wrong way. Finally, early Christ followers lived according to the assumption that their worldview convictions obviously had an impact on their entire way of life. Not only would the entire worldview of new converts radically shift, but it could not help but clash with other worldview. The Way utterly destroyed all false notions of reality and put followers in direct conflict with the surrounding culture. The Way was an all-encompassing, exclusive way of life and meant that Christ followers were set apart and could no longer live according to past societal norms and structures. Jesus Christ broke all preconceptions and set a path for his followers to follow the one, true way. It is in this context that James wrote his book of wisdom. Wisdom that he grounds, from his first line, on the importance of joy for the believer. 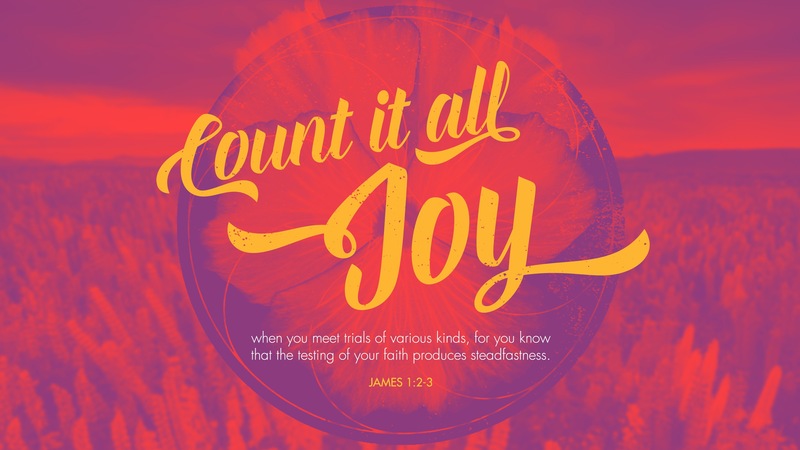 The book of James opens with “Count it all joy” signalling the importance of such a teaching. A more literal translation of this verse translate “consider it pure joy” (NIV) instead of “count it all joy” (ESV). That means James placed the words “pure joy” and “trials” in the same sentence, an impossible feat by all worldly standards, only possible if God is in the driver’s seat. James encouraged believers to embrace their trials for what God could accomplish through them, not for what the trials are in and of themselves. As one commentary states, joy for James is not the product of circumstances but an essential expression of faith. The faithful way to live life as a Christ follower is to count it all joy when you meet trials of various kinds. It is essential to maintaining one’s faith through life’s trials. It is essential in the testing of faith, formation of our souls and in following The Way. So why consider it pure joy? Because the purpose of this life isn’t gladness, satisfaction, fulfilment, happiness, love, success, fame, or any other Hollywood buzz word. The purpose of this life is to glorify God. Glorifying God by becoming perfect and complete, lacking nothing. Not doing this out of our own skill or merit, but through the testing of our faith. This testing comes from the triumphs and trials of everyday living in a fallen world. Everyday living proclaiming the gospel and being hated by the world. Everyday living remaining steadfast in the face of chronic or terminal illness. Everyday living learning the true ugliness of human nature. Everyday living in a fallen and broken world. Joy isn’t gladness masquerading as blind faith, ignorance, misplaced hope or any other rose-coloured reality. Everyday living in a fallen world means there will be trials and that our faith will be tested. That is a guarantee. But if we count the trials and testing as joy, trusting God to use evil for good, steadfastness (perseverance) will be our reward. God will make us perfect and complete. Already washed clean by Jesus’ perfect sacrifice, trials shape our soul and help us become more Christ-like. Who wouldn’t want to do all they can to become like the perfect God-man who walked this earth and never sinned? The all-knowing deity who humbled himself, even to the point of death on a cross – the most wretched way for man to die. The loving saviour who defeated death and rescued the lost and the lame. The more Christ-like we become, the sweeter our offerings smell to God, the closer we come in relationship with Our Father and sharing in the power of the resurrection. Joy isn’t gladness masquerading as blind faith, ignorance, misplaced hope or any other rose-coloured reality. It is seeing the full picture, however bleak it may be, and resting in the hope of God’s plan and in the knowledge of his grace, mercy and love no matter the outcome. Shadrach, Meshach and Abednego expressed this exact sentiment, not read from inspired scripture, but implanted in their hearts by the Holy Spirit. 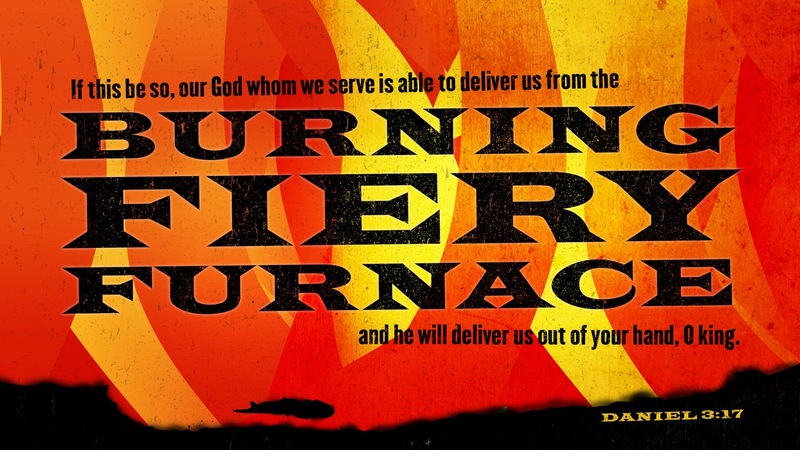 In Daniel 3:17-18, they say to King Nebuchadnezzar, who is on the precipice of throwing the men into a blazing fire, “If this be so, our God whom we serve is able to deliver us from the burning fiery furnace, and he will deliver us out of your hand, O king. But if not, be it known to you, O king, that we will not serve your gods or worship the golden image that you have set up”. These three men counted it all joy. The joy being thrown into a fiery furnace. The joy of unknown suffering. The joy of impending death. They counted the joy of relying on the Lord as their deliverer. The joy of trusting God’s plan. The joy of utter dependence and weakness. The joy of God’s strength in trials. The joy of experiencing God’s love. The joy of recognizing God’s supremacy. The joy of learning life’s true meaning. The joy of salvation. The joy of tested faith. The joy of steadfastness. 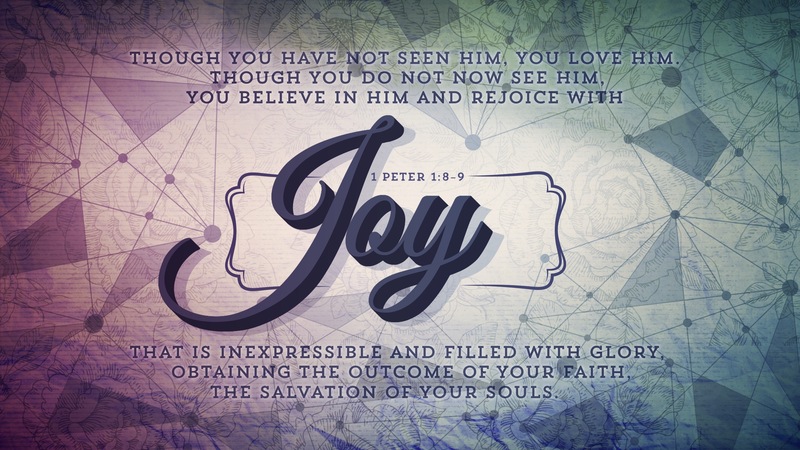 The joy of seeing Jesus. The joy of the true reality of their God being known. 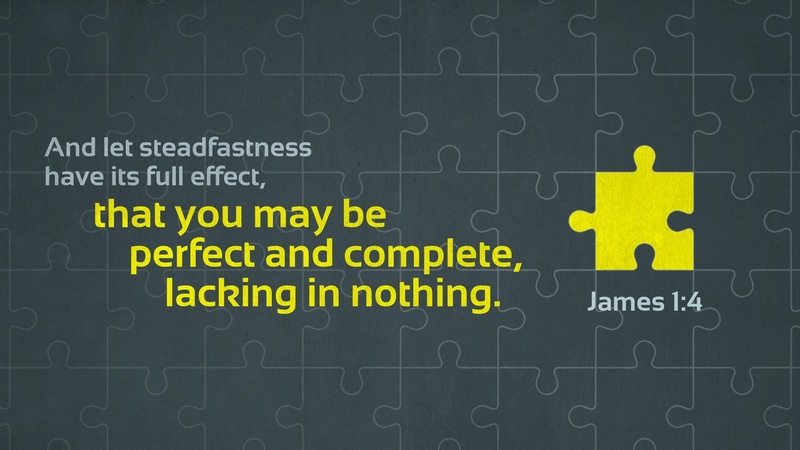 The joy of being perfect and complete, lacking nothing. The joy of becoming Christ-like. Counting it all joy. We as Christians count it all joy because Jesus Christ has saved us.This joy comes from the fruit of the Spirit, present in the lives of believers when the gospel has taken true root in their hearts. There is no height or depth that could separate us from God. He has saved us from the worst suffering imaginable – complete and utter separation from Him. Saved from such a fate, everything in this life is joy. Therefore joy is found not only in the good times but also in the bad because now we have hope. Hope that is eternal, hope that never fades, hope that is always with us – hope from Calvary hill. And so now we count it all joy, because our goal in this life is to become complete and perfect, lacking nothing. Not through any action of our own merit, for there is nothing we can do, but through Jesus’ resurrection he broke all chains and we are free. Our joy is found in triumphs and trials, and is so great it is comparable to that felt by shepherds, serenaded by a chorus of heavenly angels, hearing the gospel for the first time. This extravagant joy is soul-shaping and causes us to become Christ-like, lacking nothing, so we may rejoice in heaven all the louder. 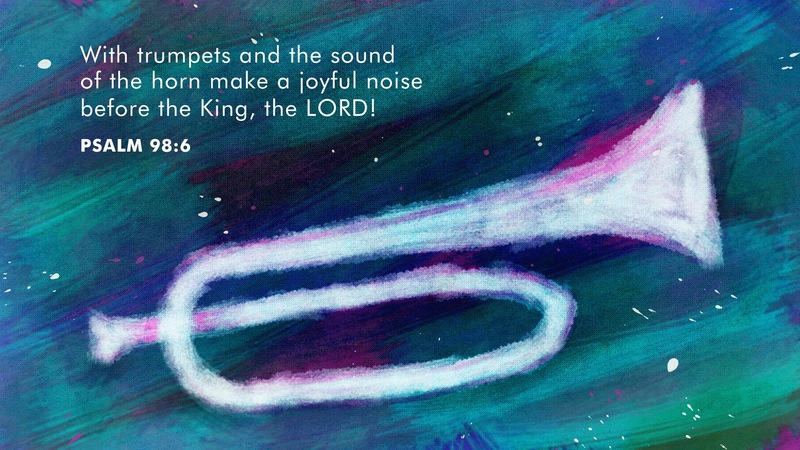 So we count it all joy and make joyful noises! For further thought and discussion: Read Hebrews 12:2. How does Jesus’ understanding of joy influence his mission and purpose? Carleton University Journalism/PoliSci Grad. Christian - Psalm 143:8. Addicted to apologetics & theology. Political junkie and TV fanatic. Fibro/CFS. Calgary native - born and raised. Oh, and if you haven't noticed by now, I'm a makeup fiend. And eyeshadow palettes are my Achilles heel.